The Bush Administration legacy of torture grows, and its claims to Congress were false, according to a new report by Human Rights Watch. The United States government during the Bush administration tortured opponents of Muammar Gaddafi, then transferred them to mistreatment in Libya, according to accounts by former detainees and recently uncovered CIA and UK Secret Service documents, Human Rights Watch said in a report released today. One former detainee alleged he was waterboarded and another described a similar form of water torture, contradicting claims by Bush administration officials that only three men in US custody had been waterboarded. As expected, President Bush today vetoed the bill banning water boarding. 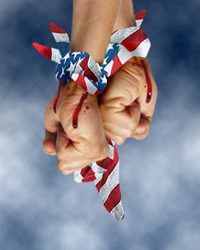 By a vote of 51 to 45 today, the Senate voted to ban waterboarding. The prohibition was contained in a bill authorizing intelligence activities for the current year, which the Senate approved on a 51-45 vote. It would restrict the CIA to the 19 interrogation techniques outlined in the Army field manual. 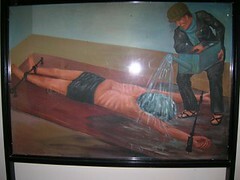 That manual prohibits waterboarding, a method that makes an interrogation subject feel he is drowning. The House adopted the provision back in December. Bush has threatened to veto the bill. As I wrote yesterday, Hillary Clinton wrote Bush Monday and urged him to withdraw his veto threat. Meet former CIA Agent John Kiriakou. He's come out to ABC News, admitting he's the one who waterboarded Abu Zubaydah (background here.) He tells ABC that Zubaydah "broke in less than 35 seconds," and that yes, water-boarding is torture. "We're Americans, and we're better than this. And we shouldn't be doing this kinda thing," he said.